Yesterday marked a horrific day in Sydney’s history as a gunman seized hostages in Lindt café. The story was not only broadcasted nationally, but also spotlighted worldwide. As I was searching for news updates, I pondered about how other people were searching for their news as well. Curiosity got the better of me, so I consulted Google Trends. The below image shows two screenshots from Google Trends highlighting the top 10 trending topics in Australia. Image A was taken yesterday (15/12/14) at 5pm, and image B was taken this morning (16/12/14) at 10am but gives an overview of the trending topics across all of yesterday (15/12/14). In image A ‘news’ was the most popular trending topic. This makes sense as early in the day people want to find out more information about the hostage situation but did not necessarily know what keywords to search. 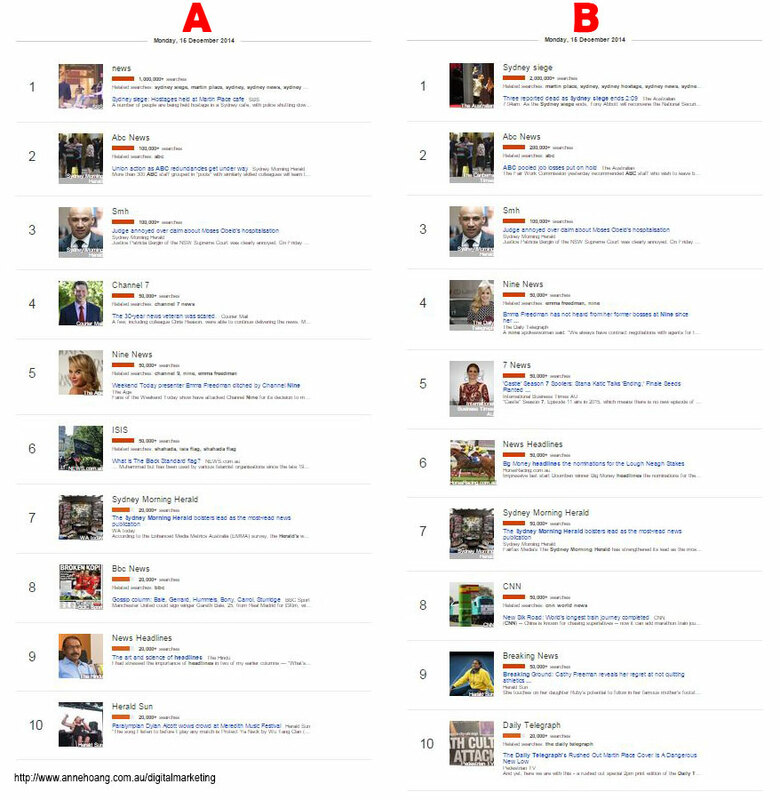 In image B ‘Sydney siege’ was the most popular trending topic, which indicates more informed searchers as the phrase ‘Sydney siege’ was used across TV broadcast, newspapers and publisher websites. People were also searching for their preferred news source. This gives an indication of the leading media outlets (in terms of online readership) with ABC and SMH in first and second position. However, Google Trends does not account for direct visitation to the news websites.